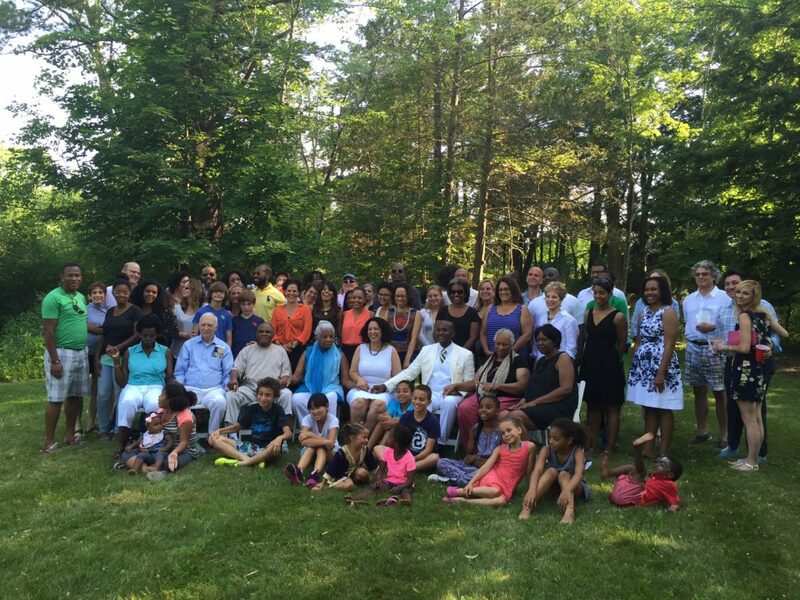 The assembled guests at the second annual celebration of Harlem Renaissance founder James Weldon Johnson whose house and writing cabin on Alford Road in Great Barrington, Massachusetts, could become a creative retreat for artists and writers. The current owners of Johnson's property are Jill Rosenberg Jones and Rufus Jones, in white, seated in the center of the group. Great Barrington — As hard as it was, and still is, to be a black man in America, James Weldon Johnson also faced the same snares and struggles of artists everywhere: finding the peace and inspiration­­ –– often only what nature can provide­­ –– to create. It is why this prolific songwriter, poet, a founder of the Harlem Renaissance, lawyer, diplomat and early civil rights leader, bought a house on the Alford Brook here in 1926. And on his way from the house to the cabin where he would write his autobiography, Along This Way, and God’s Trombones, a book of devotional poems in the style of African American preachers, Johnson crossed the same stretch of lawn, where on a recent June evening, guests sat listening to a 1935 recording of Johnson reading the first poem in that book, The Creation. University of Pennsylvania doctoral student Chris Mustazza explained it was recorded at Columbia University in a “lab meant for studying dialects.” This recording, as well as others by Johnson, can be found on the PennSound website. Johnson, who wrote the lyrics to 200 popular songs, was born in Jacksonville, Florida in 1871. His talents also found expression in education and journalism. Most Great Barrington visitors and residents who pass Johnson’s former house on Alford Road have no idea who Johnson was, or the works he produced, or that some of them were created in a tiny one-room cabin set up over a turn in the brook. But Rufus and Jill Rosenberg Jones are changing that. After buying Johnson’s home and property in 2011, the Jones’ began to establish the legacy last year, and at a second event on June 25, announced progress had been made, that they had created the not for profit James Weldon Johnson Literary Foundation in support of the performing arts, fine arts, and historic preservation. The Jones’ also hope to fix the cabin, badly in need of repairs and preservation work. Johnson’s busy life in the practical world included a peaceful warriorship against racism and discrimination in the early part of the 20th century. This man needed the soothing truths in nature, and he found them at the property he named Five Acres. Jones also said Johnson was “woefully under-recognized for his contributions.” Not many realize that it was Johnson who, in 1900 wrote a spiritual precious to African Americans everywhere, “the black national anthem,” Lift Every Voice and Sing. After drinks, and ice cream from the SoCo Creamery cart on the lawn, there was a program under a tent next to the brook. And he recalled his father once scooping up a clump of red clay and molding it for Hibbert as he read from The Creation. “The sun on his right, the moon was on his left,” Jones said gesturing towards some of the inspiration for The Creation. After a visit up to the cabin, candles were lit at long tables while children splashed in the brook. It was time for dinner, speeches and music. Along with Hibbert and Mustazza, self-taught poet and painter Tom Warner had earlier been given the first award from the Foundation. Warner grew up down the road, and as a child played in and around Johnson’s cabin. His grandfather was close to Johnson and his wife Grace Nail Johnson. Johnson’s writing desk was eventually handed down to Warner, who wrote his first poems at it, then later gave it to his daughter, now the children’s librarian at Mason Library. Warner got to know the Jones’ right after they bought the place. “People don’t realize how close this property was from being destroyed,” he said, noting his mother had instilled in her children a “reverence” for Johnson’s cabin, since Warner and his siblings often ran around all over the property. Warner’s painting of Johnson’s cabin resides at Emory University’s James Weldon Johnson’s Institute for the Study of Race and Difference. SUNY Purchase jazz studies professor and Pound Ridge Community Church music director Pete Malinverni also received an award for turning The Creation into a choral, dance and jazz piece, with choreography by Kevin Wynn, and featuring the Purchase Soul Voices. A recording of the work was shown later that evening, after Rufus Jones and his father, Rufus Jones Sr., tore into the night with the blues, the younger Jones on guitar, the elder at the mic. UMass Amherst History professor David Glassberg is a W.E.B. Du Bois scholar who said he studied the correspondence between the two men at a time when “the color line was no mere myth.” Earlier in the day Glassberg had given a tour of the Du Bois Homesite, just down the road on Route 23. Manhattan-based artist Selwyn Garraway, who said he had been active in a historic preservation project in his neighborhood, said he wants to contribute to the legacy by applying to the town for a historic marker for the property. He would begin that process right away, he said, so that by next summer’s celebration, a marker might be in place. Ideas of how to expand the legacy continue to pour in, the Jones’ say. It has already grown over the past year, like the tree planted by children at last years’ celebration, while everyone sang Lift Every Voice and Sing. Another was planted on this evening, the song sung again, with the intent that the words and contemplation of Johnson’s work spill out into the world from his small creative haven here in Great Barrington. Johnson was also leader of the National Association for the Advancement of Colored People (NAACP) after he began working for the organization in 1917. Tom Warner spoke to this; it is hard not to feel Johnson’s memory resonates with all, and for all time. “James Weldon Johnson carried a sword of justice with a pen and diplomacy,” Warner said. So inspiring and amazing. Thank you for the article. Thanks to the good people who have taken it upon themselves to buy and restore the house and maintain the memory and legacy of James Weldon Johnson. So it turns out that both GB and Alford are both associated with some of the most important figures in African-American (and therefore American) history, and yet there’s so little awareness of this fact and what it signifies. If this were Atlanta or Montgomery there would probably be a regular industry operating to promote awareness and celebrate their lives. They are arguably just as important to our history as, say, Samuel Adams or Longfellow, who are revered in Massachusetts for their importance to governance and the craft of poetry. This is an arena for promoting interracial understanding, allowing people of European ancestry to begin to understand why Du Bois and Johnson are so important to the African diaspora in North America and elsewhere, and why these men’s lives matter to all of us. This article is a terrific accounting of present day efforts by Jill and Rufus Jones of New Jersey and Great Barrington, MA and their many supporters to advance the legacy and raise awareness among our contemporaries about the many talents and contributions of this extrordinary American statesman, James Weldon Johnson, who was also an author, composer, songwriter, American ambassador, attorney, business leader, teacher and husband to spouse and largest supporter, Grace Naill Johnson. And GB is full of the history of African American cultural, artistic, literary educational , religious and philantropic initiatives and c ontributions to both the local GB and Berkshires community,as well as nationally and worldwide. Mac, in his comments above makes an observation that more could be done to allow for greater understanding by people of European ancestry about significant American figures like DuBois , Weldon Johnson and others, but I ‘ve found that GB takes great pride in its native sons and daughters, Caucasian, African American or mixed alike and the town expreses its awareness and pride in its own regional, low key style – typical of the Berkshires and New England region, but perhaps not in as as robust a fashion as Southern cities such as Atlanta or Montgomery, where history and events have evolved along very different paths. I love the way GB has posted clearly visible, prominent signs at entrances to the town that mention, “Welcome to Great Barrington, MA , birthplace of W. B. DuBois.” or a greeting to that effect. It makes any one visiting feel thrilled to be connected and welcomed in such a community. DuBois was born and raised in Great Barrington and was a friend of the Johnsons who discovered and vacationed for more than 20 years at Five Acres, their bucolic, summer retreat and cottage on Alford Road in Great Barrington. There, The Johnsons summered in the style of prominent people of their high station and wealth on the East coast and where Johnson found serenity and inspiration writing many of his important works in a still-standing, tiny wooden cabin on a hill that overlooks a babbling brook that winds along one edge of the estate. True or not, there is some local belief held that the cabin was once inhabited by a free former slave or family. Enough time has now passed since the Johnsons’ deaths for all Americans and foreign visitors , scholars and young people to be enlightened and to participate in securing Johnson’s legacy in perpetuity. The newly formed James Weldon Johnson foundation created by the Joneses is an important first step in this journey and superb articles such as this in the Berkshire Edge penned by Heather Bellow go a long way to garner wider public awareness of Johnson’s living legacy as it continues today and eventual access to his extraordinary and extensive body of literary works, art, memorabilia, photographs, music compositions and scholarly publications now held in academic repositories at Yale and Emory universities, soon available for our consumption, enjoyment and education through interpretive exhibitions, fundraising opportunities, public dimension education programs, symposia, media celebratory events. I can’t wait to see it all unfolding in the coming years. Four hostile newspapers are more to be feared than a thousand bayonets.